Moving to Morocco for a year? I'm thinking about moving to Morocco for a year this fall where my boyfriend lives but I'm still undecided. I'm visiting this June for 3 weeks and I obviously wont make a decision until that happens. If I do go through with it, we plan on getting married when I move there and applying for the CR-1 visa. -Would me moving there for a year greatly improve our chances of getting approved? (assuming the other requirements are met). -Could we begin the process while I'm still in Morocco? Has anyone on here done this before? It's a big decision, but it seems like the best option right now. I'm at a place in my life where this is possible but I don't know if that'll be the case in the future. I can't really afford to make multiple visits and I know that's important for this process...plus my boyfriend and I have been together for two years now and we're at the point that we just want to be together, wherever that might be. However, I am worried that I'm being naive about how different life in Morocco would be. When I visit there this summer I'll get to see what it's like but I know that visiting there and living there are two different things. I'm working, so I would save up money and my boyfriend has a job as well so we wouldn't be completely broke but I'm still expecting less luxury than America. If anyone has done this before, please please share your experiences!! Generally, the more time you spend in person together, the more evidence you can build to convince the consular officer in Casablanca that your relationship is genuine. So yes, I do think that living together will increase your chances of approval. Definitely go on a short visit first like you are planning to do this summer before making a final decision. I think 3 weeks is just enough time for you to begin to see how daily life is lived in Morocco. The lifestyle you live in Morocco will depend a lot on where in Morocco you are living. If you are living in a bigger city like Casablanca, Rabat or Tangier, you will find some 'modern' comforts like cinemas, malls, hospitals, public transportation, and groups of people speaking English. If you live in one of the more remote towns, or even just right outside of some of the major cities, you will generally have a tougher time adjusting to the local culture. Many smaller towns are more conservative and they don't always have modern appliances like flushing toilets and reliable internet. You can start the CR-1 process while living in Morocco, but keep in mind you will still need to show proof of domicile in the United States. Also, how will you handle the financial support aspect of the petition? I've known several women who moved to Morocco and where able to meet the affidavit of support requirement by working online jobs while living in Morocco, or you could use a co-sponsor. @RJandHamid Thanks so much for the good information! 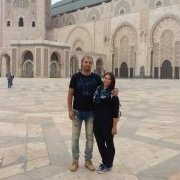 I've been planning on using a co-sponsor but I would love to work in Morocco if possible. Do you know what any of these online jobs were and how they got involved with them?